This repository is a staging area for patches from newer developers to be committed for testing. Patches where the functionality is approved can be committed here, before having comprehensive review. 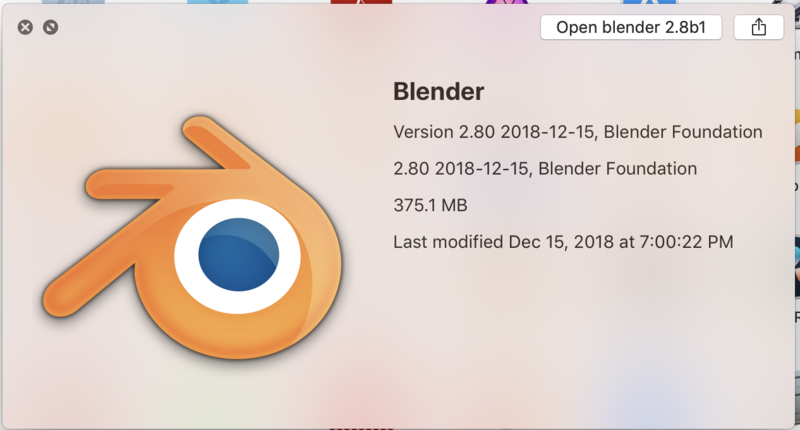 Developers who don't yet have access to BF Blender repository can gain access to this repository. Each release we will re-sync the repository with master. While we're more relaxed about changes in the staging repository, there are some guidelines to follow. Don't write broken blend files. Loading Blend files in the official release shouldn't crash. Isolate commits. Don't use single commits for changes in many, unrelated areas (making it hard apply your changes for releases). Keep personal preference out of it. Unless its needed for you're development, keep defaults for preferences, keymaps etc, matching official releases. Patches accepted for the staging repository. Bastien Montagne (mont29) closed T61955: Blender sticks as Archived. Campbell Barton (campbellbarton) added a member for BF Blender: Staging: John Bartle (johnbartle). William Reynish (billreynish) added a comment to T61955: Blender sticks. Please try the latest build from builder.blender.org. cotooleimages@gmail.com (ProEffectsMAX) added a comment to T61955: Blender sticks. Campbell Barton (campbellbarton) triaged T61955: Blender sticks as Needs Information from User priority. cotooleimages@gmail.com (ProEffectsMAX) created T61955: Blender sticks. Philipp Oeser (lichtwerk) closed T59486: Bug with reflections. Eevee as Archived. Jacques Lucke (JacquesLucke) triaged T59486: Bug with reflections. Eevee as Needs Information from User priority. Nikolai (frank1) created T59486: Bug with reflections. Eevee. Campbell Barton (campbellbarton) added a member for BF Blender: Staging: Daniel Griffin (dgriffin91). Brecht Van Lommel (brecht) added a member for BF Blender: Staging: Brecht Van Lommel (brecht). Campbell Barton (campbellbarton) added a member for BF Blender: Staging: William Reynish (billreynish). Campbell Barton (campbellbarton) closed D2989: T47435: Adds deformation axis selection to the Simple Deform modifier. Campbell Barton (campbellbarton) updated the diff for D2989: T47435: Adds deformation axis selection to the Simple Deform modifier. Campbell Barton (campbellbarton) accepted D2989: T47435: Adds deformation axis selection to the Simple Deform modifier. Thanks for the updates, looks good - will apply today. Dan Marra (dmarra) updated the diff for D2989: T47435: Adds deformation axis selection to the Simple Deform modifier. pad and pad2 have been removed. dcut has been reintroduced for bend mode. Dan Marra (dmarra) added a comment to D2989: T47435: Adds deformation axis selection to the Simple Deform modifier. Sure I can do the reordering before and after the simpleDeform_callback gets called; sounds like a good idea. Campbell Barton (campbellbarton) added a comment to D2989: T47435: Adds deformation axis selection to the Simple Deform modifier. Am not sure using idx for every index access is worth the hassle, I think it makes the code needlessly complicated. All requested changes have been made. Campbell Barton (campbellbarton) requested changes to D2989: T47435: Adds deformation axis selection to the Simple Deform modifier. Dan Marra (dmarra) created D2989: T47435: Adds deformation axis selection to the Simple Deform modifier. Campbell Barton (campbellbarton) added a member for BF Blender: Staging: Jacques Lucke (JacquesLucke). • fsegsg (fesdg) created T49771: <WAS SPAM>. • sxadfawsfs (gmyr) created T49770: <WAS SPAM>. • maya tripathi (maya95) created T49768: <WAS SPAM>. • maya tripathi (maya95) created T49767: <WAS SPAM>. Campbell Barton (campbellbarton) added a member for BF Blender: Staging: Julian Eisel (Severin). Campbell Barton (campbellbarton) added a member for BF Blender: Staging: Antonio Vazquez (antoniov). Thomas Dinges (dingto) closed T48339: Windows executables and installer lack digital signatures by Blender Foundation. as Invalid. We don't sign binaries on Windows. That is not considered a bug. Nathan Pietres (syncolp) created T48339: Windows executables and installer lack digital signatures by Blender Foundation..
Campbell Barton (campbellbarton) added a member for BF Blender: Staging: Germano Cavalcante (mano-wii). Campbell Barton (campbellbarton) added a member for BF Blender: Staging: Alexander Gavrilov (angavrilov). Campbell Barton (campbellbarton) added a member for BF Blender: Staging: Stephen Kelly (steveire). Campbell Barton (campbellbarton) added a member for BF Blender: Staging: Khanh Ha (khanh_ha).